I’ve been really silent lately and I haven’t communicated much with the community on what I was working on and what was happening. I was in France this summer on a 3 months unpaid leave. This gave me the opportunity to see how my life would be affected if I was to leave my job and I’m happy to say the experiment was a total success. So more on that later, but I just wanted to apologize for being absent, as a lot of things are happening around here and they’ve kept me away from this blog. The development on the upcoming Linux Mint 8 ‘Helena’ started in the Summer and a series of improvements are already implemented. Today, I’d like to show you the impact on one of our most popular application: mintInstall. 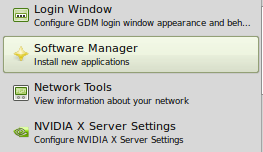 The icon is changed as well, from the Linux Mint logo, to an relating to what the application does. 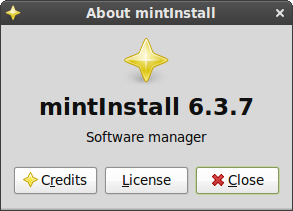 In the case of mintInstall it’s now a yellow star. These changes make more sense for the users, they make the overall operating system look more coherent, more elegant and more professional and finally they make it easier for users and developers of other Linux distributions to reuse our technology. When an application is listed, mintInstall now queries APT to find out whether it’s installed on the system and what versions are installed and/or available. This process is almost immediate and doesn’t impact the responsiveness. This basically means that, looking at an application, you’ll be able to see if it’s already installed or not, you’ll be able to see its version and you’ll be able to install it but also to remove it from mintInstall. 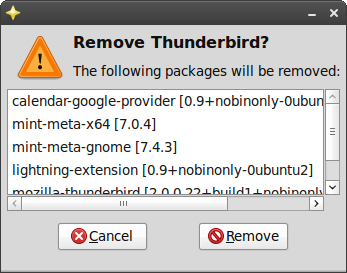 In the example below, mintInstall shows you that Thunderbird 2.0.0.22 is installed. Note that this method of removing applications is similar and visually identical to removing applications from mintMenu. The refresh button is gone. To avoid too many hits on the Linux Mint server the data available to mintInstall isn’t up to date with the data present online in the software portal. Every now and then the team refreshes that data by exporting the content of the portal’s database to XML meta-data. In brief, and in simple terms, you had no way of knowing when this data was updated. You could click on the “Refresh” button every day and get nothing out of it, and when the data was finally updated you had no way of knowing about it. So this is gone now. The data is now “refreshed” by us and packaged into a new package called mintinstall-data which mintinstall depends on. So basically, when the data is refreshed, you get a Level 1 package update in mintUpdate and you never have to worry about anything else. The screenshots are not part of the data, they’re downloaded one by one, in the background, while you’re looking at the applications in mintInstall. If you’re not connected to the Internet while you’re doing that, no problem, it just fails silently without even you knowing it was trying to download anything. No lag, no error message, and no more long download sequences for you to get “all” the screenshots. The graphical interface was improved. It’s busy, full of controls and it has to fit on those netbook screens which are getting more and more popular, so changes had to be done. We got rid of the Refresh button and of the progress bar at the bottom. The border sizes of many of the components was reduced. The space was used differently, in particular for the screenshot, and the action buttons. You can submit your comments here. If you have ideas you can register blueprints, and if you want to look and modify the code, you can have a look at our git repository. Next time I’ll go through the mintUpdate improvements we prepared for Linux Mint 8 Helena. Je vois que ça bosse toujours autant chez Mint ! Et toujours de bonnes idées 🙂 C’est pour ça que j’aime Linux Mint. I’m so excited about these new developments! Can’t wait to hear about what else you have cooking for us! 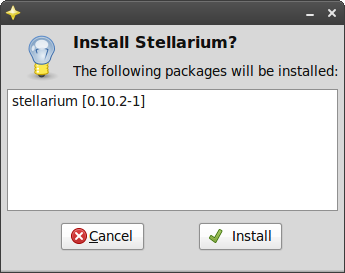 “The following packages will be installed / removed” is useful information to have if you’re a poweruser, but it could just be confusing if this is your first introduction to Linux. Also, in the confirmation dialogue asking you if you’re sure you want to remove something, because of the red “no smoking” sign used for “Remove” both options look like “Cancel” options at first glance. Maybe there could be clearer iconography for this? Merci pour ces améliorations. Il est en effet bien vu d’améliorer la visualisation du logiciel avec un image de plus grand taille. Une petite question, est ce que Mint 8 sera livré avec le dernier noyau 2.6.31, qui intègre de nouveaux pilotes mais surtout, améliore sensiblement l’utilisation de la mémoire virtuelle et la réactivité du server X ? Lookin at the MintInstall app as it is now it seems like you could have a drop down box for the screen shots. Allow the users to close the screenshots to make room for the review box you got there. specially with the way you moved the buttons to a line at the top. Seems to be another way you can make it “netbook friendly”. Personally I don’t always care about what the app looks like if I’ve already seen it. I guess at least you can try to make an icon which identifies installer with mint, I don’t like that yellow star. While I look forward to the next few releases of MintInstall its days are surely numbered. The new Ubuntu software store will surely go on to replace Mint Install in the long term. I see little point in reinventing the wheel. I personally think this is a good thing though. 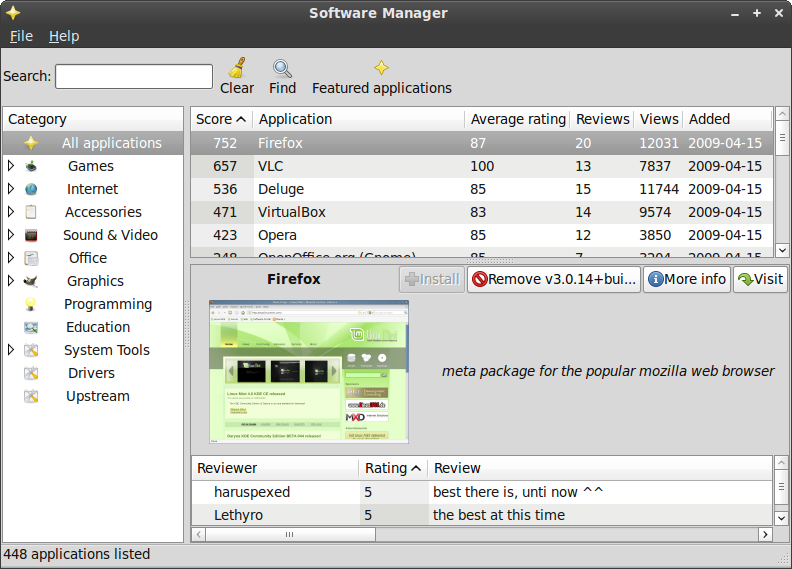 The more Ubuntu replicates Mint ease of use it more it frees you up to improve other aspects of the desktop experience. AKiRa121: We’re now the 4th most widely used OS at home. We’ve passed the stage where we want to put our brand on everything we do and constantly remind people of who we are. Our tools are of good quality but so far they haven’t integrated well within the Gnome desktop, they’ve looked like an odd supplement to it. They’re complimenting the desktop though, so they should integrate with it the same way other Gnome, Debian, Ubuntu, 3rd party applications do. In the end it doesn’t matter who does what and who’s using it, the nature of Open Source is re-usability, so let’s make our desktop the best we can and not worry about losing some credit or some exclusivity. belovedmonster: The Ubuntu Software Store isn’t good enough yet (the version that came with Ubuntu 9.10 alpha 6 anyway) to replace the current Ubuntu offering and it certainly doesn’t match our expectations to replace mintInstall. It’s hard to forecast how things will be in the future, but we’ll always pick what’s best for our desktop whether or not it’s our own tool, and if there are things we like in the Ubuntu Software Store that are missing from mintInstall we’ll make sure to port them over. 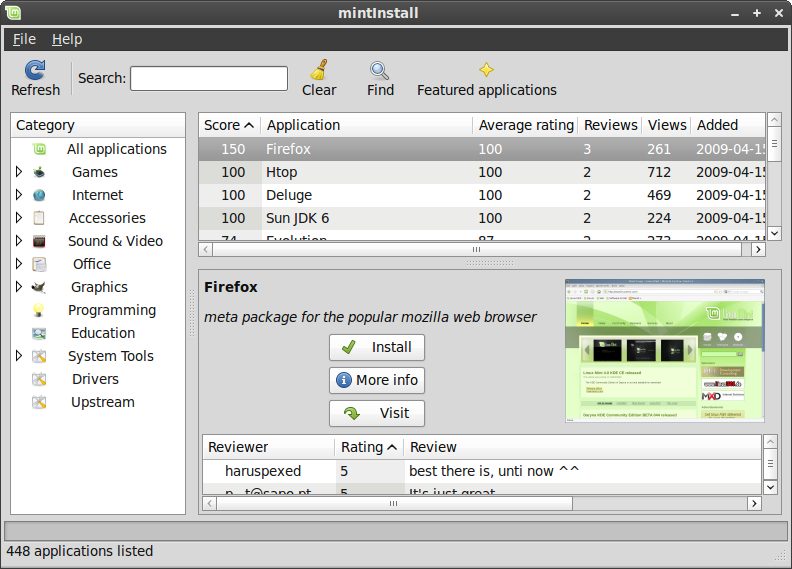 Note also that mintInstall is 100% made of our own technology, written from scratch from the ground up. I personally know its code very well and so the efforts needed for us to improve it or tweak it the way we want it to be are far less than if we were to patch or fork someone else’s technology. In the long term that can be a deciding factor. There are a number of improvements Ubuntu copied from us without using our implementation and which weren’t as satisfying as what we originally had. In those cases we look at the pros and cons of going for their solution or keeping ours, I’m sure you remember some of the old tools that are now obsolete, and if you look at the differences between Mint and Ubuntu you’ll see different implementations of the same ideas here and there. Of course that’s also true of us towards them, for instance mintUpdate was written from scratch even though the Ubuntu Update Manager was already completely stable at the time. In the end of the day, it’s nice to have a choice and a little bit of competition between solutions. I really like some of the ideas behind the Ubuntu Software Store, I don’t think its current implementation is convincing though and the general direction taken by Ubuntu and Mint regarding software management is also slightly different, so for now we’re improving and using the ideas we already have, and for Mint 9 we’re going to have a real brainstorm and see where we go from there, the idea of a unique interface is seducing, but that should be done without losing any functionality. Excellent ! Je trouvais déjà MintInstall utile et de qualité mais par cette modification celui-ci va encore monter d’un niveau. Merci pour le travail effectué afin de nous offrir constamment des améliorations de notre OS préféré. I whole heartedly agree about the current version of the Software store being no where near replacing Mint Install, but if you read the future plans for the Software Store its clear that it is going to win out the long run. It might take a few cycles but it will surely happen (IMO). Good work , every time a new Mint ( Gnome ) comes out, you simply feel after a few days it has improved ! But what will be the difference between Gloria and Helena ? I must say that every neW Mint feels also a little slower in some points, why i don’t know, its still the same machine here, and every time a fresh install with new home partition. But please keep the stability as it is , there you do not have any competition ! –which has adept and other brand manifestations..
–I don’t see how that makes a significant difference; and I probably would keep using synaptic for cross-distribution options; so that my brain doesn’t have to remember distribution specific differences, or at least to limit the number I must choose to remember. Nice work I think. Being fairly new to mint I like the branding and think it might actually help the windows immigrant, kind of like a friendly face. I haven’t seen the new app store, but when I read it it sounded like Linspire’s click and run, which I tried years ago. I thought it was a little clunky. I am so excited about this distro still! Having spent the better part of the day of putting my daughter’s laptop with no restore disk or partition together I have had quite enough of windows for a while. I like what I see in the screen shots! I like the removal of the branding and the feature improvements. Very professional looking and this makes it very easy for other distributions to adopt the technology. Mint user since Bianca. Looking forward to Helena. Don’t know about too many changes. Rather see Mint becoming a bit faster. Keep up the good work. I like the new interface, because it has been annoying to view comments on mintInstall on previous versions (not that I look that often, but when I do). I can’t wait to see what else is coming, a slightly more customisable mintmenu, maybe? A guy can hope. I was wondering if there are going to be made any improvements on the wireless compatibility for laptops, including the installation of modules for the kernel and some more “out of the box” drivers for mint 8, it would greatly enhance the mobile experience for mint. A view menu should be introduced, so you could select the things you want to see, like for example see or not the screenshots or the reviews. Personally these are things that i don’t look at when i install a program but some people does, so i think you should let users to decide. sorry .. to be more specific I was talking about the Atheros 9285 chispet and newer ones.. 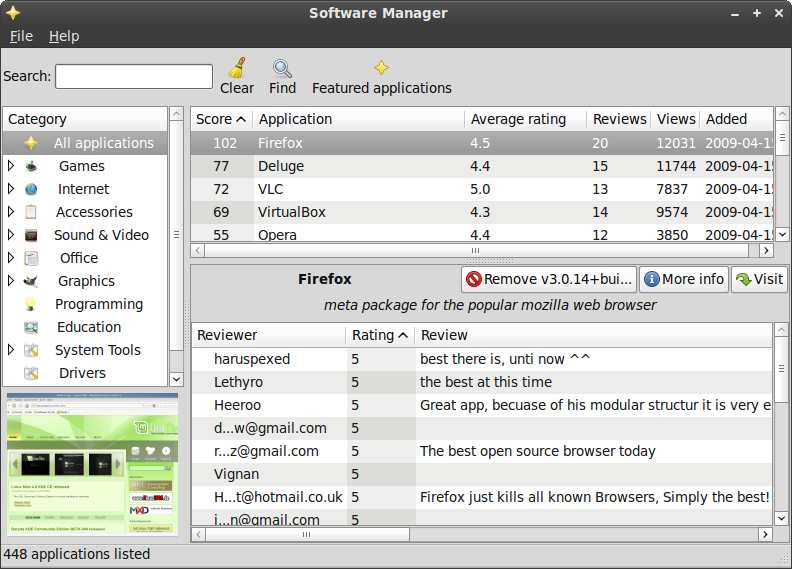 In the second screenshot which shows the improved Software Manager why not move “File” and “Help” just to the right of the star in the upper left hand corner? This would put everything in one line and reduce that portion of space by half. Seems like it would make it slicker. (maybe). Anyway, love Mint and looking forward to what’s ahead. In Mint 8 going to use the latest Kernel which is likely to include drivers for new hardware releases?. The Atheros AR9285 wireless card springs to mind. I guess what I’m really asking is:- Do the Mint developers decide what kernel is used or are we stuck with whatever Ubuntu chooses? Good job with the improvements, and I look forward to seeing more. Thanks again for all of your awesome work, and congrats at cracking the No.4 spot in the distro ranks. My only suggestion with the logo is to perhaps allow, by your own doing or someone elses, to let the user decide on their logo post-install. It does seem trivial in the grand scheme of things, however it’s clear that by now you have an army of passionate followers (hand up) who are PROUD to be using Mint. Just my $0.02. I will miss the Mint* named tools, but I understand your choice and think it’s a good move to make it easier for others to adopt them. In the end it will be a win-win situation. So now comes my second one 😀 Why not move the screenshot under the category panel, the way it is done in rhythmbox to display the cover picture ? That may require to enlarge that panel to fit the screenshot size, but you can also reclaim some width on the applications list to the right by changing “Average rating” to “Rating” for example (because everyone assumes that this rating is an average one). Also one question while I’m here: why is the “Average rating” on a different scale than the reviewers “Rating” (scale 100/ scale 5) ? Thanks for the update Clem. It’s nice to see what you’ve been up to. I like the changes except for the yellow star, which doesn’t seem to symbolise an installation app. Otherwise nice work! Thanks Clem for doing such a great job and giving the chance for the commen folk to comment and even make suggestions. I have a feature request, I personally find it frustrating looking at the installer and seeing just the name, I’d rather have a brief description of what the app is and does, than a pretty picture that I can hardly make out. (even though I just clicked on one then and found out it pops up). Anyway, the application itself is fantastic, especially comming from Slackware as I did. Thank you so much for making Mint what it is today! Great job on Mint as usual. Could you talk about the direction of the project? Any plans to move from Ubuntu? I know I had read something about this possibility elsewhere. Thanks. For a green plus sign a good pair is a red minus to say remove something. Both “Featured Applications” and “All Applications” shares the same icon, a yellow (gold?) star. For featured ones is a good idea but for all it would be better to see the “old one” Mint icon to draw a distinction, or something other than that star. The buttons can be in two lines: one for Install/Remove and under it the More-info/Visit. The name also can be on the right, above the text that describes what the app is for. Because it is bold, everybody finds it. The screenshot determines the height; it’s a fix (is it?) and what height it uses gives the space on the left/fight to fill whit other things. Too big unused space on the right of the preview-screenshot. If the goal is to be handy on small screen-sizes e.g netbooks, it’s a waste. Fill all available space, aesthetical. And for the end thanks again. Good good job! I agree w/ Zak on the branding, I am so satisfied with Mint (also in since pretty well the beginning as a user), I constantly tout the useability of the distro, maybe I will just re-skin in the end but my machine will show Mint in the end. I love Mint. It’s the best distro and I can’t wait to see Mint 8.
with my junk. I really love it. today is over a year i am involved in linux revolution and firstly i started with ubuntu 8.04 and now after i tried different distros i would say that i elected as best Mint as well as Ubuntu and i cannot wait to update new realease Helena on my Toshiba prosatellite i think even brand more blasoned have to rethink about open source revolution!!!! probably Mint have to be faster than Ubuntu to see significant improvement….. I like mint install. The only thing that prevents me from using it more in Gloria is the search functionality. Sometimes I want a software to do “something” without knowing the name. In Synaptic I can search “Astronomy” and Stellarium will show. In mintInstall I need to know either the category or the name of the application. Buttons could have fly over tips to know what they are for. What is the difference between “search” and “find”? I always thought they were equivalent. It always confuses me that clicking “find” opens another window that asks for the search term again With a lot of options that I have no clue about (what is a .mint package as opposed to a getdeb or apt? I searched for “astronomy” in all of them and didn’t get stellarim. Hey, I just saw that it also searches on “description” just that the description is shorter than synaptic’s. Could you “borrow” the description from the package so it is searchable too? Thanks Clem, its OK, I understand your point now, anyway I agree with Robbin Rensenbrink, I’d like mint to become a bit faster, and again, I’d rather prefer another icon instead the star. the star icon could even be replaceable with the mint logo if desired. incorporate progress bar into the far right of the bottom bar. I know this could be a lot of work, but it would look cool/professional and maybe solve some issues. Just a thought from a newb. To implement this I had to asynchronously fetch the APT details, so in other words while you’re using mintInstall for the first few seconds it’s still loading in the background… (APT queries are quite lengthy), of course there’s no impact on the responsiveness, you just see that it’s not fully ready yet in the statusbar. I hope I haven’t lost anyone with this comment 🙂 Basically it’s really good news. Just a little note to state the limitations, when the multiple-install is implemented you’ll only be able to queue up Mint applications which are “trivial” (i.e. which only define packages, no execution strings, no repositories). I forgot to say almost 99% of mint files are trivial, so it’s not a big problem in itself. As a marketing professional, I will miss the branded installers/apps. As a previous comment suggests, it helps Windows (or even Mac) folks feel better about their choice by making Mint seem more “downtown.” Still, if the changes help reduce overhead, I’m fine with it. I think a better integrated backup utility would be great though. I want to make an image of the entire disk without having to think about it. Keep up the rockin’ work! I hardly use mintinstall or synaptic. login via ssh on my server from my iphone and using apt-cache and apt-get is the way to go for me. But my girlfriend loves to use it because of the screenshots. i love the way Mint looks and im always recommending it to friends, family and co-workers starting with Linux. I attended an Oracle Workshop in Amsterdam and was showing off my mint install. people couldn’t believe how cool these new linux distro’s look like nowadays. Well, I for one liked the branding. I thought it was very clever. But if this is the direction Clem wants to take, so be it. In my eyes, Mint can do no wrong. Nice one…did realy like it…!! how about a driver section with various wifi / wireless modem patches to choose from? i mean a section of successful tweaks/patches to install from where the mint/ubuntu community have tried and worked into the mintupdate or even better, during offline install from a database of various wireless drivers to install from…this will make mint / linux in general ALOT more attractive to newbies. yes, i agree with the previous posts that mint is feeling slower as the new realease come through…i mean ive downloaded and tried as much previous mint distros and they do seem to get that slower. The way Mint is done is the way lots of distributions should get inspired from. There is that feeling that whatever you say (well as long as it makes some sense), you can be heard. Something i’d love to see changed is the spacing between Icon and Text on the Buttons – Mostly the Icons are way too close like 1px and sometimes 2 buttons have drastically different spacings. So to make the look more coherent and less cramped the Icons should be like 3-5 pixels from the at all times. Another thing is the Icon for uninstalling kinda doesn’t fit to the action that is performed, it should be a minus or something like that. I hope that there will be descriptive names for hardware components. to go outdoor to work. Very good improvements and please go ahead…Keep on the good job. I do not like that yellow star (icon). mintUpload and i could not connect to the server. or: there is no space available. Love the new look and love the options. would love to see more innovated idea’s on how to make the install programs easier for the end user. Email me if you want but I love the work and am now evaluating the linux mint Gloria. Having problems with the nvidia drivers would love to see that fixed but looks like in the new Mint you have????? I think there should be an option to filter all the installed softwares so it’s easy to clean up. Even tough the synaptic can do that it would be good if the mintInstall could. I will send you only one URL – that containing the .pdf file and PM you. Well, i think mintUpload service was not working anymore. So, i will look for another option. I agree with lpbbear. MintInstall checking for updates every 5 mins is almost ridiculous. When I do a clean install of Mint I always change the ‘check for updates’ to once a day. Seems fair considering updates don’t come quite that often anyways. Alot of times I even just remove the app from the startup, and just check manually once a week or so. P.S. (correct mintinstall to mintupdate in that last msg). I updated Mint about a week ago….and just now getting a couple updates to install…..every 5 mins? jeez. thats hundreds of unnecessary checks that could have happened in that week. guys, you can configure yourselves mintInstall so it look for updates let’s say, just once a day, just open mintInstall, go to edit>preferences>updates and change 5 minutes for 1 day, this way mintInstall will only look for updates every time you start your system. course we can just change it ourselves….the point is why check every 5 mins? Like lpbbear said when it runs it makes games lagg and stuff like that. Is it really necessary to have the default set that often? p.s. AKiRa121 did you not read the part where I said “I always change the ‘check for updates’ to once a day”. I clearly already know how to change the settings. I’m not an idiot. I have 10 years experience in operating systems, and 6 of that is Linux. Was simply trying to make the point that a default of 5 mins does seem a bit too often to me. Clam AV is really not great. Can you install F-prot by default instead with the Gui for it? It picked up all the viruses on my xp NTFS mount that CLAMav did not! F-Prot linux for home use is free. Also, how do you “RDP” VNC or VINO into Linux Mint on a fresh reboot before any user has logged on? I am looking at tightvncserver right now to do this. Have Tight VNCserver run at boottime. Any Chance of having VLC, Picasa, Google Desktop, Google Earth, SKype all installed by default? BTW, I recently switched all my computers (XP/2003 server) to Linux Mint at home. I love it! I just need the file manager to look more like Explorer where you can copy and paste locations in the location bar at the top. Also the ability to Run as root from the nautlis /explorer. Hi, I’ve been using Mint (almost) exclusively since 6 (Felicia), and I LOVE Gloria. Can’t wait for Helena! Personally, the two things that keep me from sticking with Ubuntu (which I try every time they have a new release) are codecs and the Mint Tools, especially the MintMenu. Codecs are easy, but living without that Minty-fresh menu is difficult, so I run back to Mint every time and wait out the month from Ubuntu’s release to Mint’s release. I also have trouble using Mint KDE for a similar reason. It just doesn’t feel right anymore using a computer without the ability to install and uninstall apps from the main menu. I’m using Windows 7 at the moment, (I need Windows for college, so I got the free Release Candidate) and I can’t help but think MS took a couple ideas from the MintMenu. But I promise I’ll go back to Mint as soon as the semester is over. Fortunatley, Mint 8 should be extra polished by then (not that I had any problem at all on Day 1 of Mint 7). Keep up the good work! – Reviews & Screenshots: The reviews take a lot of space, so if you have for example a netbook with a tiny screen, it would be difficult to “see” the application list, you would have to scroll down a lot! So i think that a “VIEW” menu should be put, so to choose to see things like screenshots or reviews, etc. I sure hope that the community will continue to develop Linux Mint long after Clem is gone. I’d hate to see another Linux distro bite the dust when Clem decides to take a very long “vacation”. Keep up the good work Clem can’t wait for the next release. I am pretty new to Linux as far as using it as my primary OS, I fell in love with Mint KDE and look forward to a 64 bit version. In regards to the installer I like the changes but I think a major change that would be helpfull is instead of having the reviewers at the bottom How about showing the Details of the software so that I can quickly read the description and see if it is the software I want. Maybe you could even make to so that you the choice to see the description or the reviews at the bottom or both. Also I LOVE the featured applications window. And the remove option is a major plus. Thanks for the great work! Because of it have decided to fully switch to Linux from M$. I used Mint 6 for quite a while, then out of curiosity wandered among the distros for a while. I stayed with Mepis for a long time. Finally I decided to install Gloria and once again thoroughly loved Mint. It’s my daily do everything system now. Looking forward to Mint 8 and KDE whenever that comes around. Clem, you’re doing a terrific job, keep it up. I honestly can’t think of anything that needs improvement. It’s very attractive, fairly fast, and stable. Another very satisfied user of Mint 7. I would like to thank the Mint Team and Clem for the awesome work on the Mint project. Can’t wait to see the next release, but the changes in this blog post look great! I’m kind of torn on this. On one hand, I like the mint branding, those who have said it’s a comfort point for new users are right. It was in my case anyhow. Coming from using XP for many years it was nice to see “mint-this” and “mint-that” the way I was used to seeing “windows-this” and “windows-that”. On the other hand, I’ve (mostly-kind-of-sort) learned my way around the OS, and the gnome desktop in particular and agree that the Mint specific tools compliment it very nicely. I also appreciate the open source aesthetic behind removing the branding, saying to the world “here’s some cool stuff, what do you think?” fits in more with that than saying “here’s Mint stuff!”. More generic branding is good in that respect. I have to disagree though with GoustiFruit’s point about listing the packages being only of use to powerusers. A poweruser I am not, but seeing that info helps me learn more about what’s going on “under the hood” whenver I do something, how different packages interact etc. More information, as long as it’s given to the user in as close to plain language as is possible, is always a good thing. Mint install NEEDS check boxes like in the featured applications section!!!!!!!!!! Please integrate this into version 8. Installing apps 1 by 1 is VERY tiresome and time consuming! It could show the features you loose vs perfomance improvement. It could be 3 or 4 levels of performance improvement, equivalent to 3 or 4 sets of functionalities. For the 2009/10 school year, we at leap-cf.org updated all school systems to Linux Mint 7. DisneyWorld in Orlando donated 48 Compaq Evo 500 desktop systems, and a Quad Server system, to Wilford Woodruff Academy in 2005. Initially using Fedora 5, we updated to Linux Mint 5. when it came out. For 2009 the LEAP-CF.org club donated LCD monitors. I have ensured that each parent and teacher take home a LinuxMint CDrom each year. to all the teachers, parents, home school parents, and any folks I meet, who seem interested. Having distributed over 200 CDroms of GNU/Linux each year since 1997, I have found that most folks I’ve met since abut 2002 already knew about the existence of Linux, and even have a friend or relative who uses Linux! Thank you, developers, contributors, team members! This is from me, and, each and every user I have ‘converted’! All of us are relieved to be FREE and to have so many useful programs to educate, to securely run home and offices, and to conduct profitable businesses! I have noticed that all the folks I have converted to Linux Mint make only one call to me, after they get home and turn on their Linux Mint System, and that call is to say “Thanks!”. I am pleased to forward 600 + “Thanks!” to all of you! Brilliant changes and updates! love the new innovation, new look and more. I tried other versions of linux, but after my first try with MINT I was hooked. There is NO other distros out there which comes close to this version (I have tried many!). Hope you and the team continue step ahead of the crowd, and continue to be unique in the months and years ahead. While you are working on the Installer, is it the right time and place to help make installing, in all of the various ways, to any kind of media, the most reliable and easy to do step? USB mem-stick, USB HDD, persistent, non-persistent, whatever? The latest version seems to have caused so many people trouble. How do improve on perfection? Clem, you have made my computing experience delightful beyond words. I liked the status bar. I think that it is important to me. All other operating systems have status bars and I just like the way they look. Especially on Linux Mint. Could you put it right justified of “applications listed”? Keeep ut the good work !! I have tried many many distros for the last couple of years. Mint is my linux “distro hopper stopper” no 1 !! can you put tickboxes next to each of the software options??? So the ultimate goal is, to eventually, be able to completely replace the synaptic package manager with this? No offense to your efforts intended, but I can’t help but wonder why, in parallel, synaptic hasn’t evolved into the same user-friendlyness as MintInstall. As a new user, I found it very confusing, having 2 applications in my menu with seemingly identical functions. And, figuring out that Mint didn’t allow removal, I found myself using synaptic more regularly. Of course, that will change now that you’ll be able to also remove packages with mintinstall. Any chance we can widen WEBCAM support? I’m thinkning of UVC, of course, which I think should be in the new kernel, but ALSO support for Microdia webcams (0c45:xxxx I believe), which make a wide line of cams and that are very popular in most computer outlets, for the perceived value they offer, but for which there is no support. For a while, I was only booting into winxp to run autocad and inventor. but ever since I started using skype I’ve found I have to boot into windows ever more often. I suspect that many users will be in the same situation – just for reasons of webcam not working, as we go more and more multi-media in our way of being in touch with others. We had to do it for WiFi, as it is now prevalent… and webcams too, are becoming something that can no longer be ignored. I haven’t tried this one yet, basically I haven’t tried giving mint a shot. Though I kept hearing satisfied users of it which really makes me more curious than ever. I probably would have to try it myself and see how well it works for me.